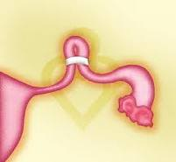 The tubal clip or Hulka Clip technique involves the application of a permanent clip onto the fallopian tube. Once applied and fastened, the clip blocks the fallopian tubes. Reversal and pregnancy success is best with this procedure and can be as high as 85%. Fun fact: Dr. Toma was taught how to reverse fallopian tubes by the inventor of the actual Hulka clip, Dr. Jaroslav Hulka. Dr. Hulka was a medical professor at UNC School of Medicine while Dr Toma was a student. Here, Dr Toma learned about the Hulka clip and also about how to reverse and repair tubals while he was in school, over 20 years ago. Dr. Toma is a skilled and well trained surgeon taught by the best. He has since worked on perfecting his technique.